Sorry beloved but the x-ray vision is not a gift for everyone. Apparently you need to be a seer. What is a seer you may ask? It is a pretend office Jennifer has made up to fleece the flock. You see Jennifer coincidentally has a "school of the seers" where she will train you to be a seer for only $300 per year! Then upon "graduation" you can join her "Company of Seers" for only an additional $330! The cynic inside of me thinks this is why her god has "encountered her heart." When I say god here I mean money of course, which clearly is Jennifer's god. The bulk of this video is Jennifer expositing the false word she claims God gave her. Yes you read that right. Jennifer recites this long narrative that starts with this absurd blurb above and then raises it to the level of scripture by pretending it needs to be exposited. That we need to exposit the notion that God wants to give seers a "look-see" and bring them to a "new level of show and tell." What are we in 5th grade again? Beloved, God is not playing show and tell. This is insulting on an intellectual and spiritual level. Leclaire is banking however on the sheer gullibility of Charismaniacs who appear willing to fall for anything. After embracing holy laughter and Todd Bentley, who can blame her? PT Barnum is credited with saying there was a sucker born every minute. He obviously never went to a charismatic church or he may have had to bump up the timeline. Jennifer goes on to exposit this as meaning x-ray vision sees motives behind intentions, demons behind people's actions and demons in the atmosphere. 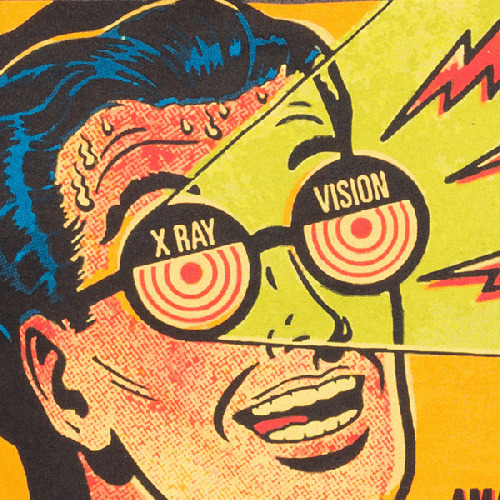 Because you know the general concept of x-ray vision was not absurd enough. Then she bizarrely claimed that x-ray vision was really a code word and God was revealing codes. She seemed confused and quickly moved off this however. Jennifer then said we get lazy just looking at the pictures in our mind and tried to tie this entire unbiblical farce back to scripture. While there are many churches who will not accept such nonsense, there are many who will embrace it, endorse it, and promote it. Those that say no are not scared Jennifer. They simply discern that you are a two-bit hustler making merchandise off of the sheep of the Lord. Those that truly discern also recognize that seeing into people's lives is wholly possible through the demonic. Beloved God may very well be drawing us into a little show and tell. He has shown us demonstrably that Jennifer Leclaire is false by merely holding the mirror of the bible up to her teachings. He shows us such things because His word has already told us to mark such people and have nothing to do with them.